For fans of Natalie Goldberg and Anne Lamott, an irresistible, interactive writing book from the Director of Creative Writing at Harvard, with 65 contributions from acclaimed authors and teachers. 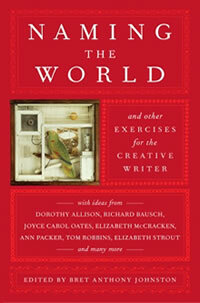 Organized and introduced by Bret Anthony Johnston, and filled with practical advice and hands-on exercises from a stunning array of contributors, Naming the World is one of the most inventive and appealing writing books to come along in years. With ideas from Richard Bausch, Elizabeth McCracken, Ann Packer, Tom Robbins, and more, Naming the World will inspire and delight any writer seeking to hone her craft. Highlights include Dorothy Allison and Joyce Carol Oates on starting a new story, Thisbe Nissen on finding ideas in Dumpsters, Elizabeth Strout on points of view, Steve Almond on character, Margot Livesey on emotional depth, and 300 quick springboards for warm-ups and practice. Packed with practical tools that focus on character, plot, dialogue, setting, descriptive language, and the art of revision, Naming the World is poised to become a perennial favorite for individual writers, creative workshops, and writing classes across the country.